Click to download a PDF overview of the upcoming Career Fair. It’s easier than you think to locate, and hire, the brightest engineering STEM talent. The University of Southern California’s Viterbi School of Engineering and CS graduate programs were recently ranked #1 in America by US News. Viterbi’s 2017 graduates and recent engineering alumni with master’s or doctoral degrees are interested in connecting with employers. Business are welcome to participate in the online career fair, to be held on April 5th 2017. Employers will have the ability to host a booth and interview candidates online for 4 hours at no cost. International Employment Experts is covering all the up-front booth costs as our commitment to USC. If you decide to directly hire a graduate you’ve met during the career fair there is a nominal fee of $500, to be paid to the event’s sponsor International Employment Experts. If your company needs further legal services or has questions regarding foreign-national employment, we’re here to help. 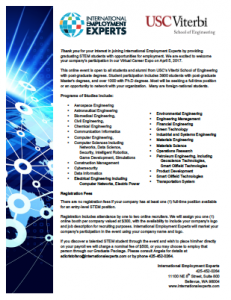 IEE has brought in over 7,000 engineers to the US from all over the world.